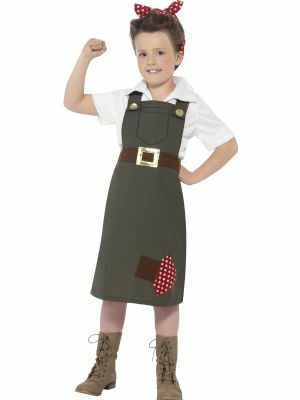 A great girl's alternative World War II costume. This munitions factory worker costume comes with dress with shirt and headscarf. It reminds us perfectly of the war effort that thousands of women gave in the 1930s and 1940s to keep Britain's military effort going. This costume is perfect for WWII remembrance events and school wartime projects.